The Los Angeles Kings have acquired right wing Tobias Rieder and goaltender Scott Wedgewood from the Arizona Coyotes in exchange for goaltender Darcy Kuemper, Kings Vice President and General Manager Rob Blake announced on Feb. 21. 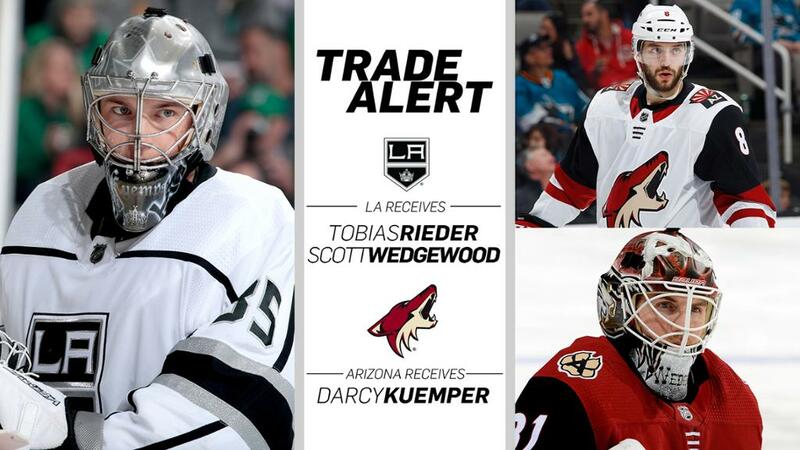 Both Rieder and Wedgewood are expected to be in Los Angeles in time for Feb. 22 morning’s game day skate at 10 a.m.
Rieder is a 25-year-old native of Landshut, Germany. Originally selected by Edmonton in the fourth-round (114th) of the 2011 NHL Draft, he has 51 goals and 111 points in 292 career regular season games – all with Arizona. In 58 games this season, he has eight goals and 19 points. The 5-11, 188-pound Rieder made his Coyotes/NHL debut during the 2014-15 season, collected a career-high 37 points during the 2015-16 season, and scored a career-high 16 goals during the 2016-17 campaign. The speedy winger has also been remarkably durable during his NHL career, appearing in 220 of a possible 223 games for the Coyotes over the last two-plus seasons. Rieder has also represented his native Germany several times on the international stage. He played for the German World Junior team from 2009-2013 (he was an assistant captain in 2013) and he most recently skated for the German national team at the 2017 World Championships, his fourth appearance with that team. Wedgewood is a 25-year-old native of Brampton, Ontario. Originally selected by New Jersey in the third-round (84th overall) in the 2010 NHL Draft, he has a record of 5-9-4 with a goals-against-average of 3.45 and a save-percentage of .893 with one shutout in 20 appearances this season. The 6-2, 195-pound netminder made his NHL debut in 2015-16 with the Devils and went 2-1-1 with a 1.24 goals-against-average and a .957 save-percentage in four appearances. He also earned his first career shutout that season with a 39-save effort at Pittsburgh (March 24, 2016). Like Rieder, Wedgewood has also represented his native country internationally as he was a member of the Canadian World Junior Championship team that captured a bronze medal in 2012. Kuemper was in his first season with the Kings after joining the team as a free agent. In 19 games he has a 10-1-3 record, a 2.10 goals-against-average, a .932 save percentage (ranks among league leaders) and three shutouts. His five previous NHL seasons were spent with the Minnesota Wild. Today’s trade between the Kings and Coyotes marks the first transaction between the two clubs since March 9, 2006 (Kings acquired Tim Jackman for Yanick Lehoux). The Kings, winners of three consecutive games, begin a three-game homestand on Feb. 22 at STAPLES Center when Kings host the Dallas Stars beginning at 7:30 p.m. The game will be broadcast on FOX Sports West and KABC Radio 790 with pregame shows starting at 7 p.m.